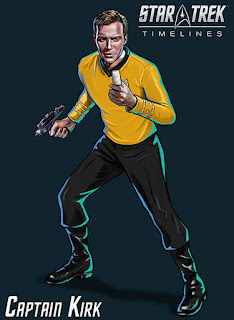 Star Trek Timelines is getting me far, far too excited thanks to the constant stream of information we're receiving. 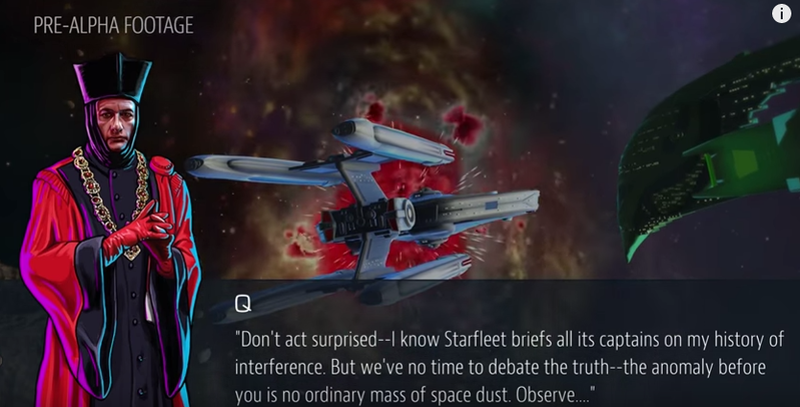 Over successive weeks we've been treated to the reveal of the Constellation Class ship, a Ferengi Marauder, more recently we've been privy to detailed information on a handful of playable characters as well as an insight into the demo from Las Vegas and much to my satisfaction, the Defiant. The ship reveals have gone a long way to illustrating the care and attention the designers have gone to in recreating the iconic vessels and the very feel of the fabric of the Star Trek universe. The way they move, act, go to warp and appear is very appreciative of the franchise and I like the respect this shows from Disruptor Beam. I thoroughly recommend and direct you to their YouTube channel (it's not SKoST but hey, they're trying(!)) to keep up to date with what's happening and any big reveals. Going back a little, I did mention those announced characters. 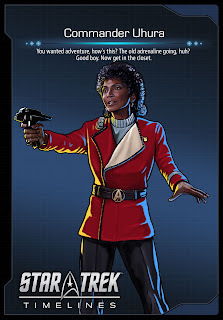 Skipping through the ton of comments on Facebook it's apparent that virtually every character ever seen in Star Trek will be available (except the Wadi if you can) and in from different points in the show. At the moment we've only got a smattering of indications plus a few snap-shots of development. I was very fortunate to get the chance to find out more about this highly-anticipated game from Rich Gallup, exec producer for Timelines; "Right now we're preparing for Beta to invite people with a fresh set of eyes to check we're making the right decisions or tell us about stuff before launch about things we need to fix. We've been playing this game for over a year and Las Vegas was great to allow fans to see it for five minutes but now we want people to play it for hours and tell us what it's like." Rich grew up watching The Next Generation with his family right through, dabbled with Deep Space Nine and Voyager but since working on Timelines he's re-watched the whole of The Original Series, The Next Generation, Deep Space Nine, Voyager and is currently about 12 episodes into Enterprise. "It's been great revisiting stuff that I knew, episodes that were familiar and I'm getting back up to speed on stuff I thought I knew and learning new bits on the way. Now I'm a part of the Star Trek community I was hesitant because there's this stereotype that if you love Star Trek you know the name of every single episode, every single ship and every single character but when you meet up with the people you're making this game for you realise that a lot of them had a favourite show they loved and are familiar with the rest." As exec producer, Rich Gallup is making sure things are getting done, priority setting and people managing. "Jon Radoff is directing the game and guiding us towards a certain vision," said Rich, "making sure what he wants is what we're making and I make sure the team have the freedom to explore that vision and make sure that they're all OK!" Each of your characters will have at least one of the core skills; Command, Diplomacy, Science, Security, Engineering or Medical which can be levelled up and will differ between characters ie. Spock is likely to be a better scientist than Malcolm Reed. 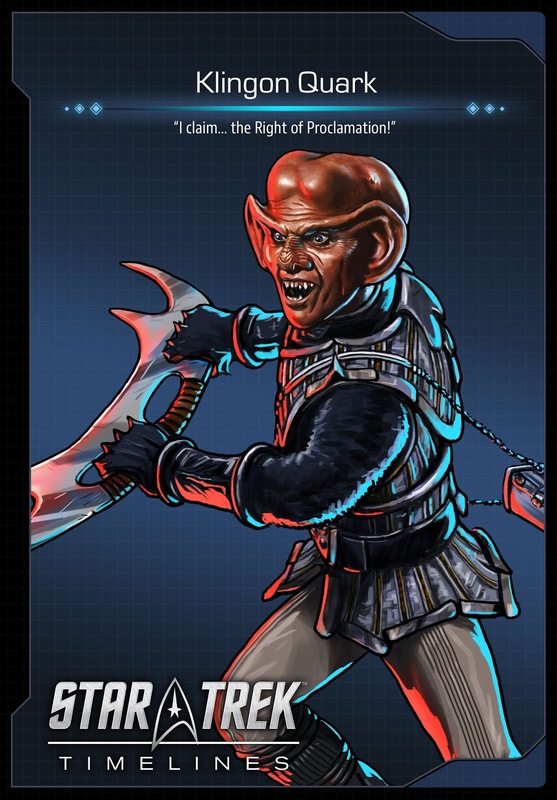 Your traits and combination of characters will then affect the outcome of the missions you place them into meaning that a diplomatic situation will benefit more from having Picard manage it than sending in Worf. 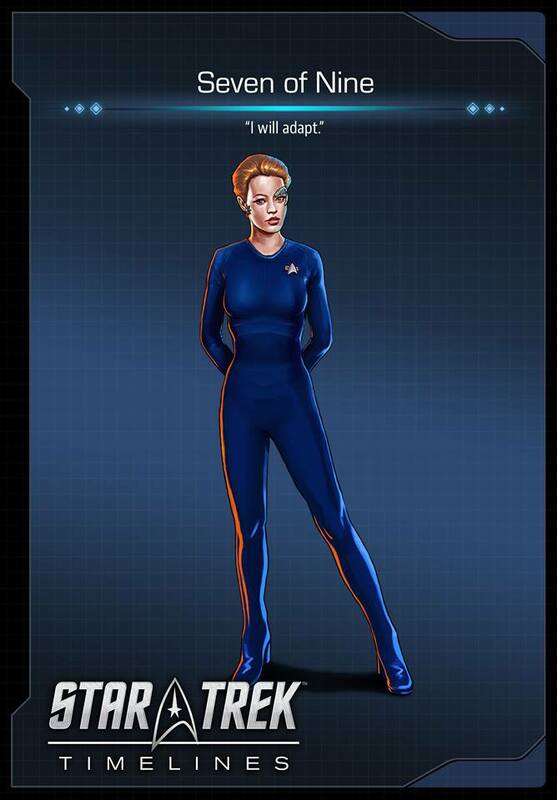 Each version of the captain will have its own attributes and differences making each a unique character within the game that will change outcomes dependant on which you choose or get landed with depending on your preferences. We also got a snap of Kruge who will be turning up here and marks our only full Klingon reveal to date. 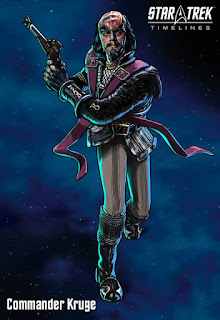 While I might bemoan Wizkids for not offering him and his Bird-of-Prey as an expansion pack in Attack Wing, here we'll get the chance to add the Genesis-obsessed power-hungry commander to our ranks. Lots of honour and combat bonuses I would think with this one. 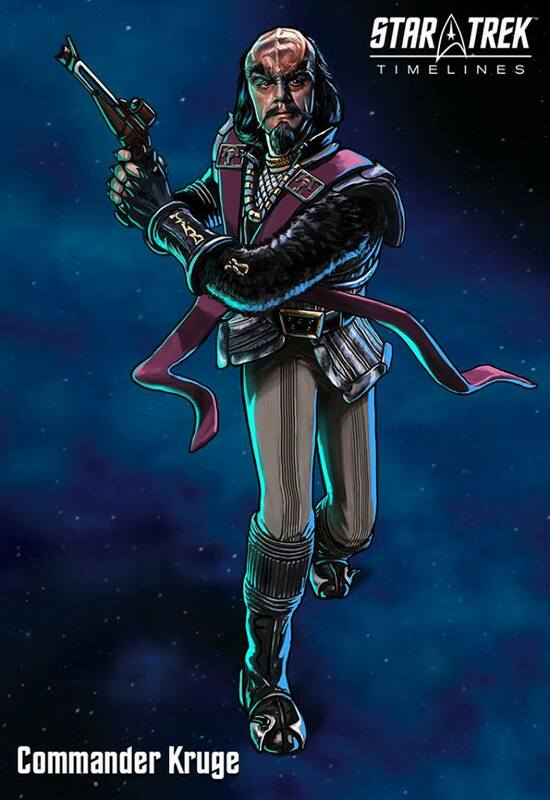 The artwork does capture a really impressive likeness although I'm a bit confused by the need for him to be running so energetically and I would have liked to see him in that weighty Klingon overcoat barking into a communicator - but who knows, that may very well be a variant in the future! One of the biggies we were shown was the action-posed Captain Kirk. 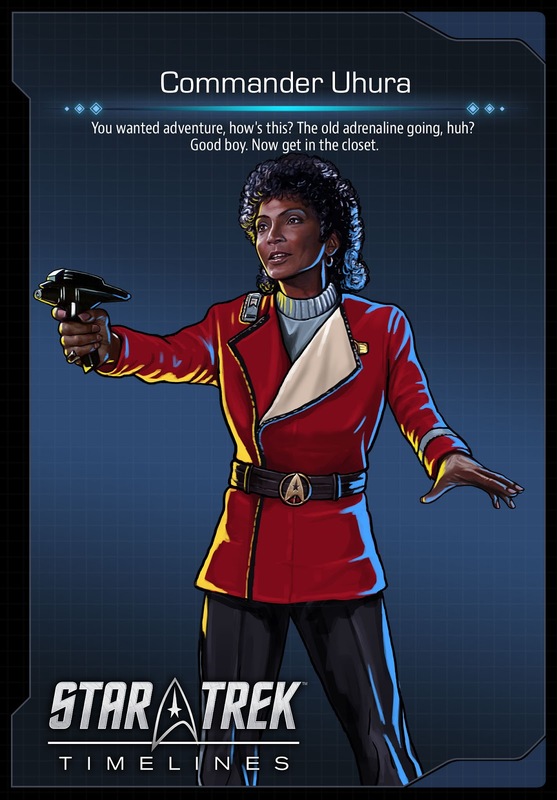 A character that is as essential to this game as anti-matter is to a warp core, there will be three versions of the Enterprise captain at launch. I can only think there will be one in his movie monster maroon and another in a selected getup from The Original Series. Specialising in Command, Diplomacy and Security, Kirk is said to be an "essential" character in the game which will mean he'll cost an arm, a leg and a starship to buy and add to your crew. Apparently having him lead an away team will add in bonuses as I suspect placing him in the command chair will also do. Comparing this to the more simply imagined Trexels, you can see there is a lot more depth to the Timelines experience. Characters will be a lot more unique visually and statistically helped particularly by the greater range of skill sets available for the developers to tweak on each person - and each iteration of that person! While that was a mental minute and we could have included a ton more, Rich was clear to note that some characters may have one iteration, others perhaps three and maybe some more but it will depend on who they are. According to a reply I had from Mr Gallup on Twitter we're going to attempt 10 Picard's next time (!). 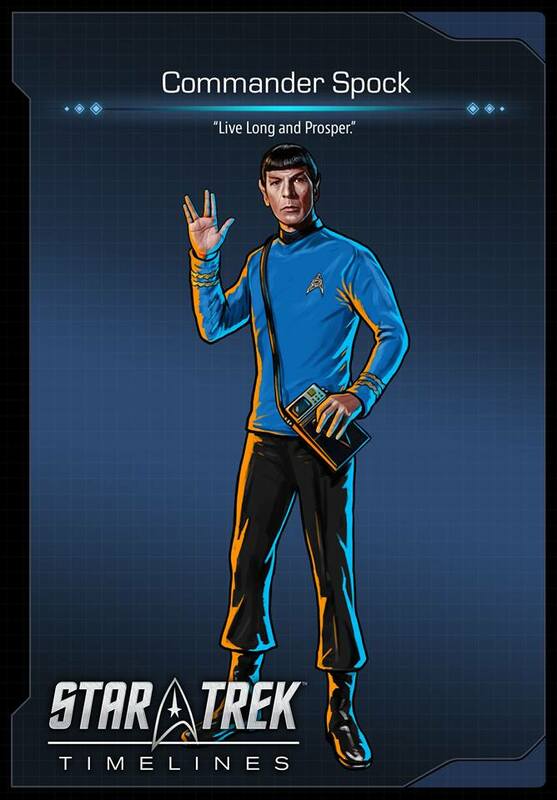 Certainly when we talk about character variants, one of the biggest has to be Spock. 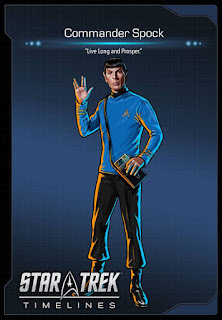 The Timelines blog has indicated we will get several versions of the Spock character including his later ambassador role but the one we were privvy to here is skilled as though he's just setting out on the five year mission with Kirk et al. 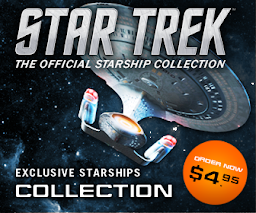 Very, very exciting to see this reveal since Nimoy is foremost in a lot of fans thoughts given his recent passing. 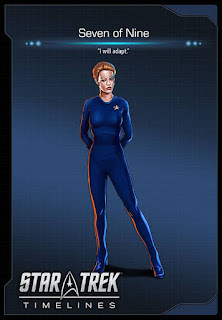 Seven of Nine wearing her blue attire from the later seasons of Voyager also popped up in previews and what we do know about her abilities is that she will be skilled in Sciences and Engineering while she'll be prone to "ignore irrelevancies" which sounds very close to her on-screen character. But just who is responsible for these great images we're seeing? Well his name is Mike Gardner, "We keep feeding him more and more and more characters and each one if better than the last." noted Rich, "It's been fun challenging him as we're making hundreds of these characters so how do you make each one distinct? The character and the costume is one thing but how do you give them personality and how do you make sure they're not all using the exact same pose? That was a lot easier to do when we were getting started but now we're so far into the game it's amazing to see the stuff he's coming up with!" We even had two Quark's and two Sulus, notching up different attributes for both characters. 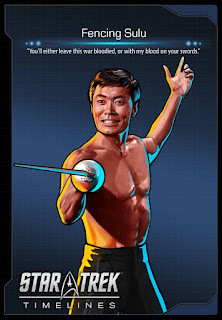 While their "generic" versions are pretty cool I was far more impressed and genuinely surprised by the announcement of Naked Time Sulu with his fencing sword and Klingon Quark from Looking for par'Mach in All the Wrong Places. "Everyone needs to have shirtless Sulu!" noted Rich, revealing that the design team, led by David Heron as the main designer, are the ones coming up with the character variants along with Tim Crosby and Jessica Sliwinski. I did ask if there might be a Mirror Sulu and a USS Excelsior captain Sulu to which there wasn't a 'No' but neither was there a 'Yes'! "It's a tricky balance because up front you need all the characters everyone loves. we'll have most of those but we do need some back for post-launch content. Then we have the skills and traits which we build onto the core characters. Then we look beyond those and look at what we need. Using variants means we can fill those holes and make sure each character feels distinct. 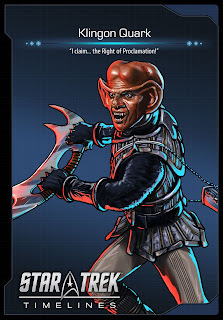 The trait system means that there might be a mission where you need a Ferengi mixing it up in a fight which would be the Klingon version of Quark. We discussed a second Quark and who that second Quark was going to be." Rich asked me if there was another version of Quark I could have suggested and with a quick head-scratch I was a bit stumped on the spot however I did state that it was best Timelines avoided the Profit and Lace variant. I have begged for it to be struck. "I did suggest to David that it could have been a little different and gone to Kahless Quark," added Rich, "as in the episode there's a moment where Quark and his love re-enact the great Klingon myth and he's dressed as Kahless. There is the possibility that that might come in later!" The more I see of this game, the more I'm desperate for Autumn (Fall) to get here and this to be released. As a Star Trek game it looks stunning but the real test will be in the gameplay, how your characters work together and how they affect the path you choose to take on missions. Timelines certainly is promising a lot - locations, ships, duty stations, away missions, a plethora of characters I can only begin to imagine, individual stats...and that's just off the top of my head. I would think that there's a heck of a lot more we're not being told with this drip-fed info keeping us from asking some of the more in-depth questions! But hey, that's not all. 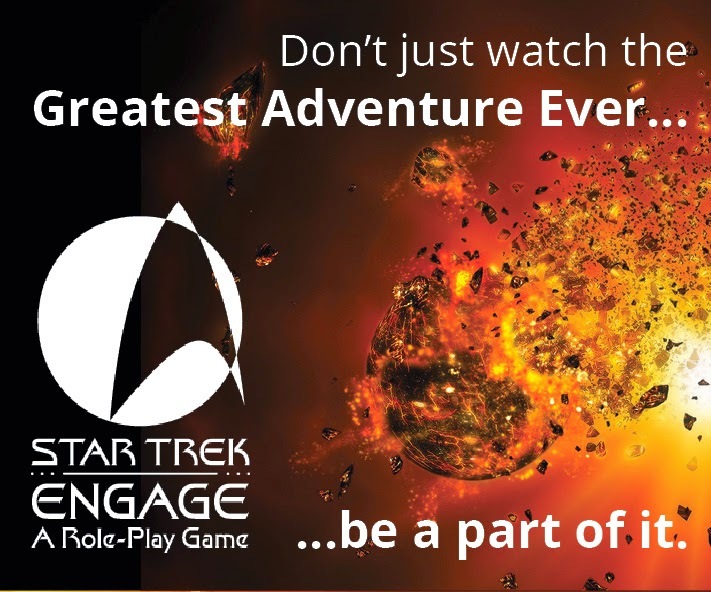 Heading to the Las Vegas convention the Timelines team managed to acquire the services of one John de Lancie to help them promote the soon-to-be-released game and showcase their ship battles element. 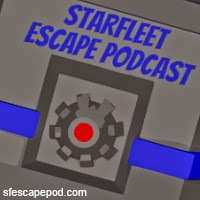 The first mission we've seen is the one demoed at Las Vegas and featuring the vocal tones of De Lancie and opens with Q greeting you at the anomaly which bleeds all the timelines into one thanks to the intervention of some pesky Romulans. As a starting level it'll be very hard to get yourself killed but choosing the wrong option could well make your game end in tears, "As you progress you will need to level up and if you're attempting a level where you're not powerful enough you'll lose and have to do it again." Later into the demo the player heads up against the Mirror Universe Worf so instead of matching wits with Q and the Romulans there might well be more fisticuffs in that part! Given that a lot of mobile/Facebook games only tend to focus on a single factor be it characters or ships, the combination of the two is a master-stroke. It could also have been very dangerous to tackle so many different parts of the Star Trek universe but the initial vids we're seeing offer evidence contrary to that possibility. "Each ship has different stations and you can assign different crew to them," continued Rich, "These show up as actions in your action bar and determine how your ship acts. The best way to upgrade your ship will be to upgrade your crew and slot them into the appropriate spot." 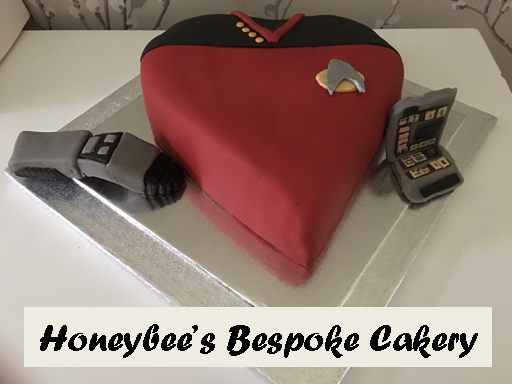 The latest reveal of the USS Defiant was, well, revealing, showing us the detail the team have gone into ensuring that she has her trademark pulse phase cannons plus that all important cloaking device. 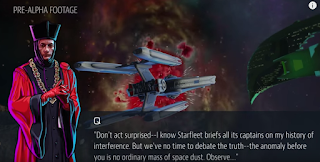 From the video on their channel it's apparent that the team have made sure they are giving fans what they want - even down to the correct number of photon torpedo launchers and colour of the phaser beams. What all the gubbins around the screen represent I can't say but finding out is going to be a lot of fun! The Defiant is my favourite ship from the franchise so to see her so painstakingly recreated here is brilliant to see. Also a cool touch that she's the only one in her class with the cloaking ability if we go by the comments from the Facebook page. Again, it's all about that essential attention to detail which is keeping me hooked. One thing that fans and followers of Timelines have picked up on was a one-off joke that you could assign Locutus of Borg to Ten-Forward. I can assure you this is still possible, heck you could make Martok your Chief Medical Officer (one-eyed or Changeling version?!). Martok is one of my favourites but I also can't wait to see what they do with Sisko. 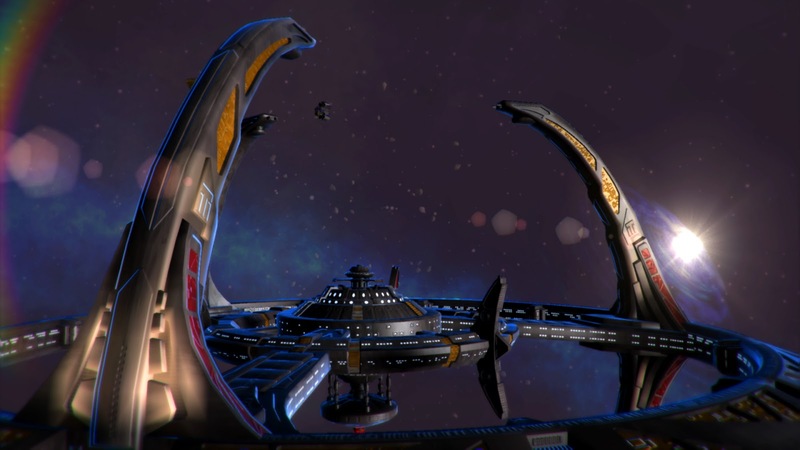 "David Heron our chief designer is a big Deep Space Nine fan," said Rich, "so you can be assured that every main character is well represented in our launch package." Reaction has been really good to the game so far, "People love it to the point that makes me nervous!" joked Rich, "We have a vision to achieve and it's been great to show people early versions of the game. I think they can see the promise of it and really hope they love it as much when we show the final version! Hopefully what they picture is what we picture. 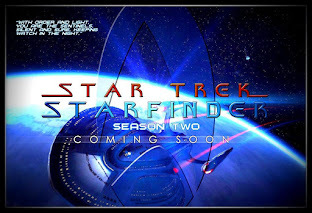 We hope we have good game-play and a variety of game-play and a ton of Star Trek for all fans." "All our testing has been on mobile devices as that's our lead platform but we will be porting it onto the web in some way; definitely Facebook. Game of Thrones Ascent started as a Facebook game and we ported it over to mobile and found that both player bases are equally competitive and viable. It has been as challenging as other projects," continued Rich, "but we won't know if all the work has paid off until we reach Beta (testing) and more people have played the game." In comparison to Timelines I've felt that Alien Domain or Trexels have focused on one aspect of the Star Trek universe be it space combat or away missions but here in this game there is a serious mix of a lot of elements. "A lot of that came from John Radoff," explained Rich, "He wanted this game to look absolutely gorgeous and he wanted to be able to explore 3D space. That led us down the path to make sure the game looks as good as it does. In terms of the game-play that was through a development project and we wanted to be very true and authentic to the original material. "We wanted impressive ship battles but we also wanted other methods for solving problems because Star Trek isn't just about space combat. That's why we have conflicts which is a much more abstract/choose-your-own-adventure style where you can choose to resolve matters with a combination of individuals through a series of trials. We tried a lot of different game-play systems and variations for types of skills and we felt that that was spreading us very thin. Eventually it led us to the current system which ties it all together." Rich noted that players will want to replay missions again and again to open up different paths determined by which crew members they assign to which challenge and therefore open up more parts of the game tree. 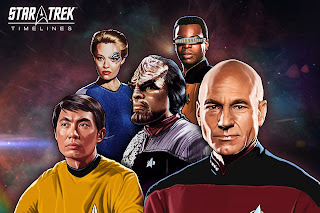 "We always wanted a lot of options," verified Rich, "because we know that the Star Trek fan-base is incredibly diverse and we want to make sure that everyone can not only find their favourite characters but can also resolve situations in a way that they would prefer." There will be a lot of scenarios available at launch with more to come later; "This won't be a game you can complete in half an hour," reassured the exec producer, "We want you to be playing it for hours and hours and as soon as possible we will release new content. For example, Game of Thrones Ascent has been out for two and a half years and we're been releasing new quest content every week. We know how to produce good content consistently. I can't say how much there will be for Star Trek or how often because Timelines plays very differently." What about Rich's biggest success and at the opposite end, his biggest challenge? Is there something that's been keeping him awake at night? 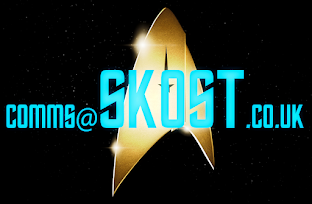 Causing hot sweats (OK I took that to an extreme)?, "It's making a game that Star Trek fans love because we're approaching 50 years of it being around and we've only been making this game for less than two. We've been trusted by our friends at CBS and challenged by the community to make something that is worth their time, love and attention. It's a little terrifying but I think we've been the team to take it on and from the reaction we're proving that we can be trusted to make the next great Star Trek game." BIG thanks to Rich Gallup and the team at Disruptor Beam for their help with this article and for all the images used. Are you as excited as I apparently am over Timelines? Which character are you most anticipating? Which ship?